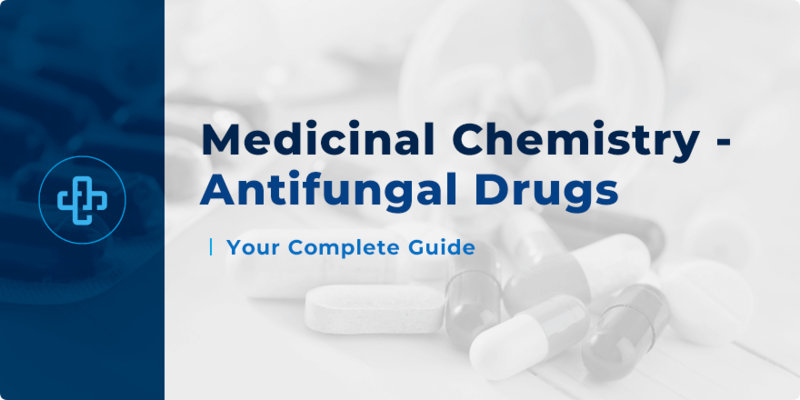 In this section, we offer a comprehensive assessment of the medicinal chemistry of antifungal drugs. Their medicinal chemistry could not be more important, not least because fungal skin infections are now the fourth most common disease in the world today – afflicting up to 1 billion people. We begin by explaining the structural features that set fungi apart, before going on to understand the chemical factors that make antifungal drugs as potent, and as effective, as they are. The vast majority of fungal infections are caused by Aspergillus and Candida. In comparison to the number of drugs available to treat bacterial infections, the number of drugs available to treat fungal infections is comparatively small. Unlike bacteria, which are prokaryotes, fungi are eukaryotes (like mammalian cells) meaning fungi and mammalian cells, such as human cells, share similar biochemistry. Although mammalian cells and fungal cells are both eukaryotic, there are several biochemical differences between the two that are exploited by various antifungal drugs. Unlike mammalian cells which only possess a cell membrane, fungal cells have an outer cell wall. Mammalian cells and fungal cells also differ in the sterol component of their membranes. Ergosterol is the sterol found in the cell membranes of fungi whereas cholesterol is found in animal cells. As part of this discussion of the medicinal chemistry of antifungal drugs, molecular structures are shown below. We invite the reader to assess possible intermolecular interactions which are established between the drug and its target, and possible modifications to the drug itself. The following analysis covers the following antifungal drug classes: polyenes, allylamines, and echinocandins. Polyenes are macrocyclic compounds which bear several conjugated double bonds and distinct lipophilic and hydrophilic regions – containing carbonyls, hydroxyls, and a sugar. Examples of polyenes include nystatin and amphotericin B. Polyenes work by inserting themselves into cell membranes. This results in a rise in membrane permeability and loss of cytoplasmic constituents which is detrimental to fungal cell viability. The lipophilic region of polyenes interacts with sterols via hydrophobic interactions. Polyenes have greater affinity for ergosterol-containing fungal membranes so, in other words, polyenes are more selective for fungal cells. The structures of nystatin and amphotericin B are shown below. As an exercise, can you point out the lipophilic and hydrophilic regions of each drug? The concept of bioisosteres is evident in the case of tioconazole and fluconazole. Fosfluconazole is a more water-soluble prodrug of fluconazole. Alkaline phosphatases convert fosfluconazole to fluconazole in the body. What is the name of the functional group introduced in fosfluconazole? What kind of carrier-linked prodrug is fosfluconazole? Allylamine antifungals (such as terbinafine, butenafine, and naftifine) act by inhibiting the enzyme squalene epoxidase. As a consequence of inhibition, the ergosterol content of the fungal cell membrane decreases, which leads to altered physicochemical properties of the fungal membrane, resulting in malfunction of membrane-bound proteins. Squalene epoxidase inhibition also leads to an accumulation of squalene, which is toxic to fungi cells at high amounts. What is the fused ring system common to the three compounds called? Certain classes of drugs exploit the fact that there are drug targets present in the infective agent that are absent in human cells. For instance, penicillins exert their antibacterial properties by interfering with the synthesis of the bacterial cell wall; a structural feature not present in human cells. As mentioned earlier, fungal cells have – unlike bacterial cells – a cell wall. On the other hand, human cells do not. So far in our understanding of the medicinal chemistry of antifungal drugs, we have been analysing drugs which involve ergosterol and its synthesis. Here, though, we deal with compounds which inhibit fungal cell wall synthesis – a class known as the echinocandins. Echinocandins are noncompetitive inhibitors of the enzyme, 1,3-β-glucan synthase. The glucosyltransferase enzyme, 1,3-β-glucan synthase, is involved in fungal biosynthesis of beta-glucan, a natural component of fungal cell walls. Osmotic instability is one of the consequences of decreased glucan production. Echinocandins have fungicidal activity against most Candida and fungistatic activity against most Aspergillus. Anidulafungin, caspofungin (structure not shown) and micafungin are examples of echinocandins. Echinocandins are cyclic peptides that have a long lipophilic chain. Due to the class’ limited oral bioavailability, intravenous routes of administration are preferred. Which of Lipinski’s rules are being violated by anidulafungin and micafungin? Before concluding our analysis of the medicinal chemistry of antifungal drugs, we must briefly refer to other antifungal therapeutics. First discovered in the culture broth of a certain species of Penicillium, griseofulvin is used nowadays to treat fungal infections of the skin. Griseofulvin is ineffective topically and used orally for the treatment of superficial fungal infections. Flucytosine is a fluorinated pyrimidine analogue which is converted into compounds that interfere with nucleic acid biosynthesis.